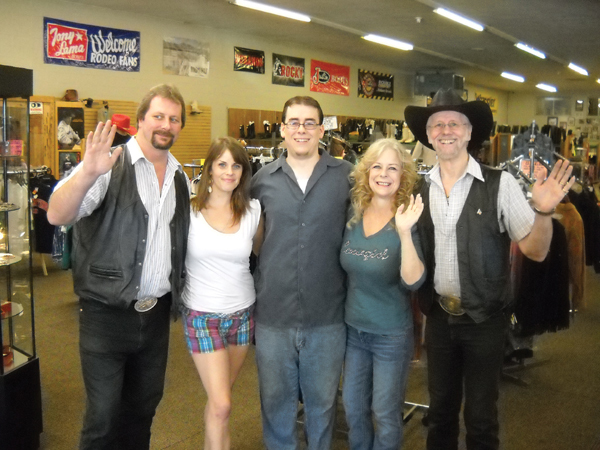 The Pedersen family – Fred, Jr., Tiffany Deal, Patrick, Sue and Fred – waves good-bye to the customers of their Winners Circle Western Wear, which will be closing soon. Due to health, the economy and other issues, the Pedersens are closing Winner’s Circle Western Wear that was opened in Antioch in 1975. Although owned by Patrick Pedersen, Sue Pedersen has been the backbone of the business. She has been ill this past year, then was injured in an accident, this year. It was the place in East County to buy a cowboy hat, big, shiny, custom belt buckle, cowboy boots and Wrangler western jeans. They served the shrinking farming, ranching and equestrian communities, including 4H, as well as bikers who sought them out for their leather vests. The Pedersens have been big supporters of community activities, like 4H, rodeos and equestrian events. Originally opened on 18th and A Streets, they moved to 2nd Street, then finally to West 10thStreet to a 13,000 square feet building in June, 2009. But with the changes in East County from an agrarian to a more suburban community, plus some competition from other stores and the general downturn in the economy, plus Sue’s health, things changed for Winners Circle. People are calling telling them they’ll be missed. Pursuing an online education means that you probably hope to one day land a great job in your field of interest, but when entering the workforce, chances are you’ll be starting from the bottom and working your way up. A common way of working from the bottom up comes in the form of the internship. You probably know someone who’s interned, or perhaps you’ve been an intern yourself, and you know that sometimes internships seem like more trouble than they’re worth. While internships are widely held to be a valuable way to obtain experience in your field of interest, when pursuing an internship, it’s important to take into consideration the relative costs and benefits to your own professional well-being. Now, compared to as recently as a decade ago, more and more schools are requiring students to intern, and many companies won’t hire grads who haven’t completed an internship. But when students or post-grads are expected to intern without compensation, the experience can become noticeably less valuable. Studies show that students who intern without receiving pay in return tend to learn less, perform more menial tasks, and be hired on full-time at a lower rate than students who are paid for their internships. The following infographic takes a look at the perils of the unpaid internship, and why you should think before you accept one. Graphic by OnlineCollegeCourses.com. Posted with permission. The Antioch Police Department held a ribbon cutting ceremony at their station on Saturday, September 29th, commemorating the installation of a new medicine collection unit and the initiation of their permanent drop off program. This event was held in conjunction with the Drug Enforcement Administration’s fifth National Prescription Drug Take Back Day. Prescription drugs that languish in home medicine cabinets are highly susceptible to diversion, misuse, and abuse, creating a public health crisis and harming our environment. The number of people aged 18 to 25 who reported using prescription drugs for non-medical purposes in the past month was 1.7 million in 2011, according to a study published this week by the U.S. Substance Abuse and Mental Health Services Administration (SAMHSA). The same study shows that a majority of abused prescription drugs are obtained from family and friends, including from the home medicine cabinet. In response to what the Centers for Disease Control (CDD) has described as our nation’s prescription drug epidemic, the DEA has been conducting national Take Back days every six months or so to help educate the public about how important it is to purge their medicine cabinets of unwanted and expired drugs, and to dispose of them responsibly. Americans participating in DEA’s four previous Take-Back Days turned in nearly 1.6 million pounds—almost 774 tons—of prescription drugs. DEA’s last event in May collected more than double the pills as their first one two and a half years ago. With a permanent drug collection unit being installed at the Antioch Police Station, community members in Antioch and surrounding communities will now be able to drop off their medications Monday through Thursday, from 9:00am to 1:00 pm. The new drug collection unit was gifted to the Antioch Police Department by NCAPDA, and made possible by the generous donation to NCAPDA by the makers of the box, MedReturn. www.medreturn.com/drug-collection-unit.php. Members of the Antioch community are encouraged to drop off their unused and expired medications there. Those who live outside the Antioch area can find a nearby collection site by visiting www.dea.gov and clicking the “Got Drugs?” banner, which links to a database where they can enter their zip code. Prescription drug disposal and the DEA’s Take-Back events are significant pieces of the White House’s Prescription Drug Abuse Prevention Plan released last year by the Office of National Drug Control Policy, Epidemic: Responding to America’s Prescription Drug Abuse Crisis. The other strategies include education of health care providers, patients, parents and youth; establishing prescription drug monitoring programs in all states; and increased enforcement to address doctor shopping and pill mills. To learn more about the prescription drug abuse epidemic and what parents can do to keep their families safe, visit http://www.ncapda.org and http://www.medicineabuse.org. Thanks to assistance from the Berkeley Seismological Laboratory, the San Francisco Bay Area Rapid Transit system can now automatically brake trains when earthquakes threaten to rattle the Bay Area, allowing perhaps tens of seconds to a minute for trains to slow down before the ground starts to shake. Instituted last month, the earthquake early warning system was created with the help of University of California, Berkeley, seismologists who hooked BART into data flowing from the more than 200 stations of the California Integrated Seismic Network throughout Northern California. Electronic signals from seismic stations travel much faster than seismic waves. For quakes outside the Bay Area, these data give BART’s central computers advance notice that shaking is on the way; for quakes in the Bay Area, it provides more rapid warning. If the messages from the seismic network indicate ground motion above a certain threshold, the central computers, which supervise train performance, institute what BART calls “service” braking, which is a normal slowdown to 26 miles per hour. The farther the quake from the Bay Area, the more time trains have to slow from speeds up to 70 mph. BART’s manager of Computer Systems Engineering Kevin Copley will describe BART’s early warning system in a talk this afternoon (1-3 p.m. Sept. 27) organized by the Bay Area Earthquake Alliance. Copley will be joined by UC Berkeley seismologist Peggy Hellweg, who will discuss plans for a broader early warning system along the Pacific Coast that would rival Japan’s well-known earthquake early warning system, which not only slows trains but alerts schools and can even automatically shut valves at industrial sites. The talks are free and open to the public in the East Bay Municipal Utility District board room at 375 11th St. in Oakland. BART has long had accelerometers – devices that detect strong ground movement – emplaced along the tracks. They ring an alarm bell in the Central Control Facility when the local shaking exceeds a specific threshold. Supervisors then made the decision whether to radio train operators and tell them to initiate emergency braking to a full stop. Copley said the earthquake early warning system “dovetails into our existing procedures.” After service braking is triggered, supervisors in the control center can assess whether trains need to come to a full stop and hold. In most situations, trains remain stopped for five minutes before resuming at slow speed while scanning the tracks for problems. “This earthquake early warning system helps BART not only protect the riders but also preserve an important resource for the Bay Area after an earthquake: a functioning transportation system,” said Hellweg. The California Integrated Seismic Network is a collaboration among various groups that operate seismic sensors, including the Berkeley Seismological Laboratory, U.S. Geological Survey, California Geological Survey, Caltech Seismological Laboratory and the California Emergency Managment Agency. Allen and other seismologists were in Washington, D.C., on Friday, September 28, to talk with House and Senate staffers about the benefits of earthquake early warning systems. Meeting gives residents opportunity to address city council candidates. The Commons at Dallas Ranch will host a “Meet the Antioch City Council Candidates” Town Hall Meeting on Tuesday, October 2, 2012 at 7:00 p.m. at The Commons at Dallas Ranch, 4751 Dallas Ranch Road, Antioch. The Commons at Dallas Ranch, the premier Independent, Assisted, and Memory Care Senior Community in Antioch will welcome the Antioch City Council Candidates for a Town Hall Meeting. During the town hall meeting, each candidate will be given the opportunity to present a brief introduction of themselves and their election platform. The candidate presentations will be followed by a question and answer period by the moderator and the audience. “This is an opportunity for our residents and the community to have the opportunity to ask questions and hear first hand what the candidates bring to the table.” “We are honored to host the event.” says Dina Osakue, Community Relations Director at The Commons. For more information or to submit questions for the candidates, contact Dina Osakue at (925) 754-7772. It turns out his signature was written in disappearing ink. On the defensive, McNerney is suddenly running away from the issue that defined his candidacy and his entire record in Congress — the advocacy of green energy, its supposedly endless economic potential, and the need for costly government incentives to promote its development. Despite his ostensibly dogged commitment to green energy, Jerry McNerney was one of only two California Democrats who voted last week for the No More Solyndras Act in the House of Representatives. The legislation, H.R. 6213, calls for a complete end to clean energy loan guarantees. McNerney’s vote is more transparent than Solyndra’s discarded solar tubes (which now feature in a Berkeley art installation). It was a flip-flop designed to help McNerney survive an increasingly difficult re-election campaign. This is the same Jerry McNerney who supported loan guarantees for Solyndra, the now-bankrupt recipient of $535 million in US government-backed loans — the same McNerney who pocketed a $2,400 campaign contribution from Solyndra’s lead investor. “I think there is a need for loan guarantees,” McNerney said in the interview, designed to promote his book, Clean Energy Nation. Seems like McNerney’s true “signature issue” is saving his political career. I would like to apologize to the citizens of Antioch for the misrepresentation which took place in a political advertisement published in the Antioch Herald last week. A photograph of Walter Ruehlig who is running for City Council, was published standing alongside Rudy Fernandez and Michael Manalac. The photograph was taken in front of the grotto at St. Ignatius of Antioch Catholic Church and the endorsement alongside the photograph gives the impression that Mr. Ruehlig is being endorsed by the Catholic Church, St. Ignatius of Antioch Parish,and the Filipino-American Society. Nothing could be farther from the truth. The photograph and endorsement were done without permission and the publishing of this advertisement was very unfortunate. It is an indication of poor judgment that reflects upon the qualifications of the candidate. Again, my apologies to all those who were offended by this ad. 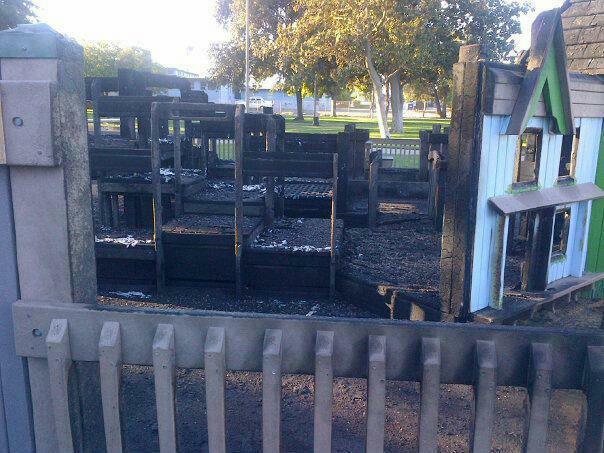 The play structure at Antioch City Park at A and 10th Streets was severely damaged by fire, recently. Two Antioch boys were arrested for arson in the case, this week. On Sunday, September 17, 2012 at approximately 10:40 p.m., officers responded to a report of a fire at the Antioch City Park. They arrived on scene as the Contra Costa County Fire Department was extinguishing a large fire at the toddler play structure near the south side of the playground area. The firefighters were able to eventually extinguish the flames, but the play structure was completely destroyed. At the time of this initial investigation, the cause of the fire was undetermined. Several days later, the Antioch Police Department received a tip that the fire at City Park may have been intentionally set. Following up on that lead, APD Detectives were able to locate the two responsible juveniles and arrest them in this case. The two responsible males, age 14 and 17 and both Antioch residents were arrested for arson and are currently being held at the Juvenile Detention Facility in Martinez. Anyone with information regarding this case is encouraged to contact Detective Matt Koch at (925)779-6895. Anonymous tips may also be texted to 274637 (CRIMES) using key word ANTIOCH.